A gas leak triggered a powerful explosion in an East Harlem apartment building this morning, injuring dozens of people and killing at least seven. More than 200 firefighters responded to the blast, which completely destroyed one building and most of another. UPDATE 7:07 am: Three more bodies were found in the rubble overnight, bringing the death toll to six. The number of injured now stands at more than 70. UPDATE 9:03 pm: The death toll from the blast now stands at three. As of 7 pm, firefighters were still searching through the rubble for nine missing residents from the buildings. UPDATE 3:08 pm: The number of injured now stands at 22, including two life-threatening injuries. And here's reported video from just after the blast, from Anthony Betterflicks AB. 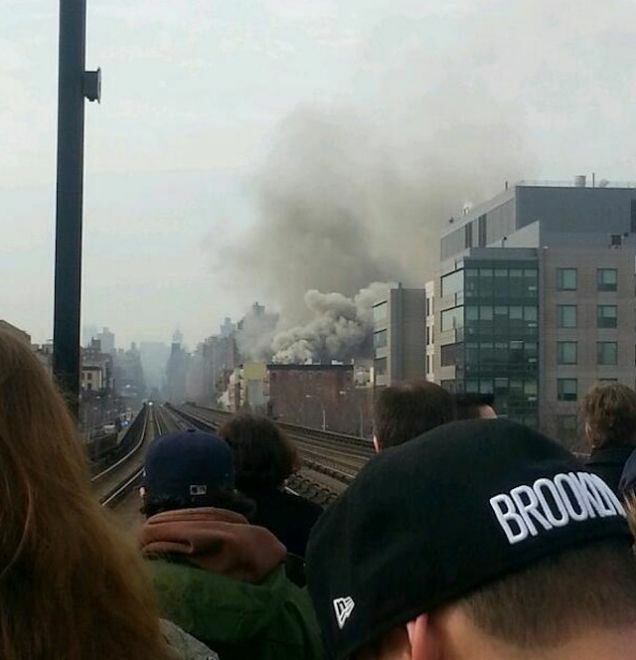 UPDATE 1:00 pm: The New York Post is reporting that at least a dozen people from the buildings remain unaccounted for. 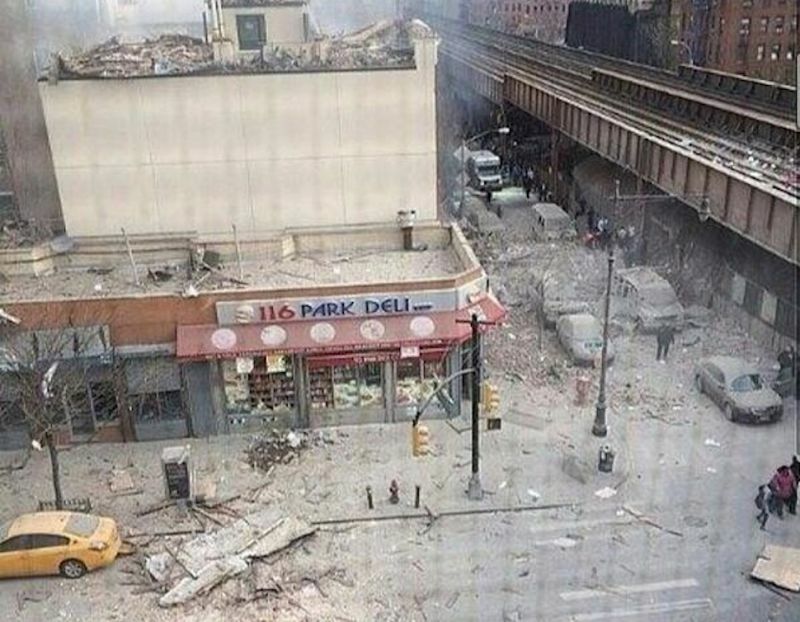 UPDATE 12:26 pm: At a press conference, Mayor Bill de Blasio said the explosion was caused by a gas leak, and that residents "had no warning in advance." He confirmed that there have been two deaths, and that several people remain missing. 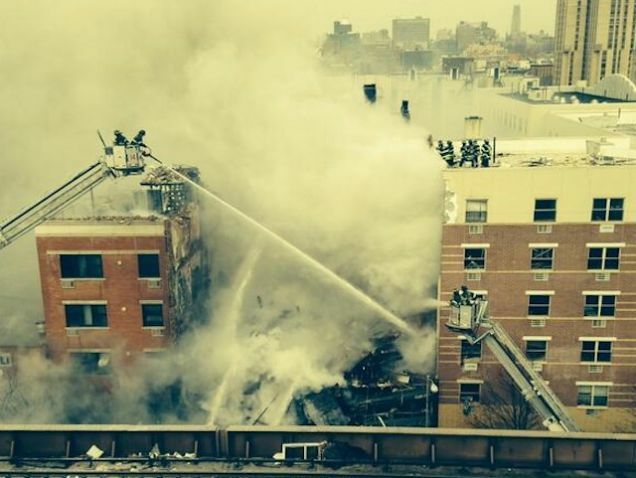 250 firefighters are still battling the 5-alarm fire, and Con Ed is working to shut down all gas lines in the area. 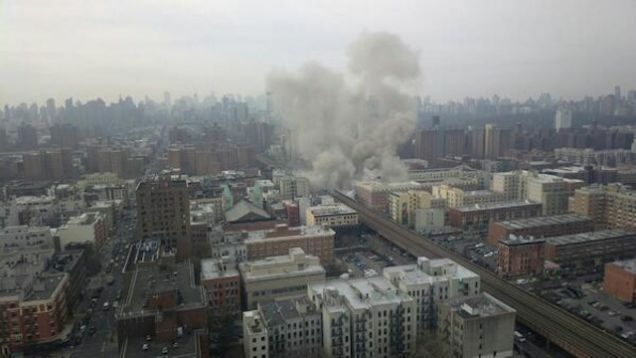 UPDATE 11:49 am: The New York Times is now reporting that two people were killed in the explosion. That number is expected to rise. The Times spoke to a woman from one of the collapsed buildings. Jennifer Salas, 20, lives in one of the collapsed buildings. She said her husband, Jordy Salas, was in the building at the time of the collapse and was still missing. "There's six floors in the building, each floor has one apartment," she said. 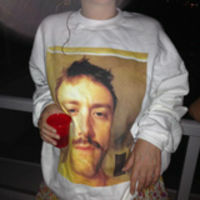 "Last night it smelled like gas but then the smell vanished and we all went to sleep. We tried to find the source of the gas but since the smell left, we all went to sleep." Through tears, she begged firefighters to find her husband. UPDATE 11:32 am: Con Edison has confirmed reports of a gas leak. 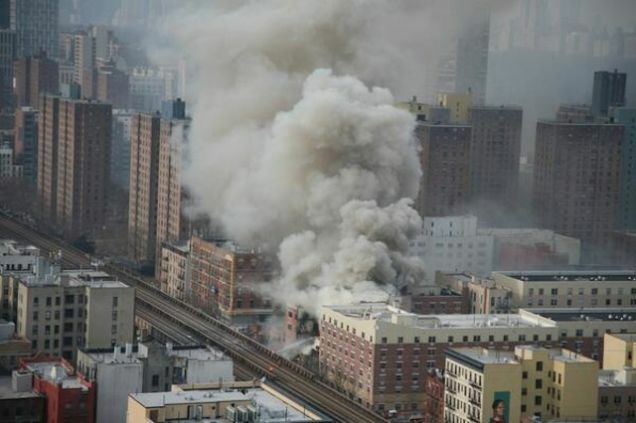 The New York Daily News has more details about the explosion and the building's history. "For weeks we've been smelling gas," said Ashley Rivera, 21, holding back tears. "We saw people flying out of the window. ... Those are my neighbors." Last June new gas pipe was supposed to be installed at one of the buildings that collapsed, 1644 Park Ave., records show. A Buildings department permit was issued to New York Heating to install 120 feet of gas pipe along the outside of the building connecting to a 5th floor stove. An employee who answered the phone at New York Heating couldn't say when the job was complete and if it was inspected by the fire department. 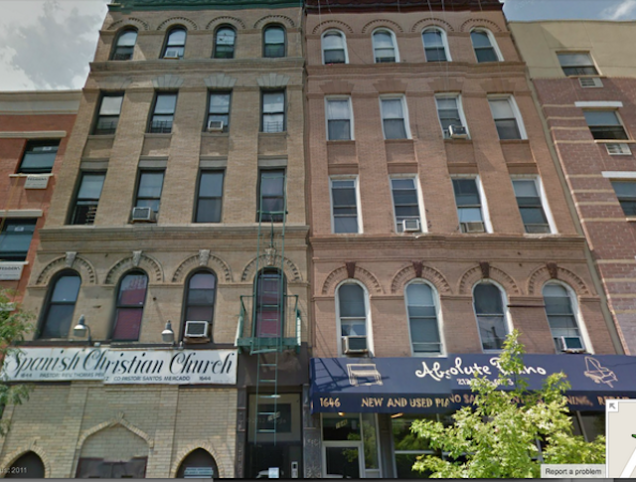 Several years ago the buildings department issued a violation against the building next door, 1646 Park Ave., after inspectors discovered the building's rear wall contained a dangerous vertical crack "which is hazardous to the safety of the structure," records show. The owner of the building, listed as Carl Demler, was issued a violation in August 2008. He apparently paid a $1,335 fine but there's no record of compliance since. "This is an occupied building, there were people living there, we have people missing," the senior official said. "There was a complete collapse; the fire is still going so we can't make a search. There will be fatalities." CNN has confirmed at least 16 people were injured in the blast. Reuters puts the number of injured at 17. The building, at 1644 Park Ave., is now completely "gone," according to the NYPD. 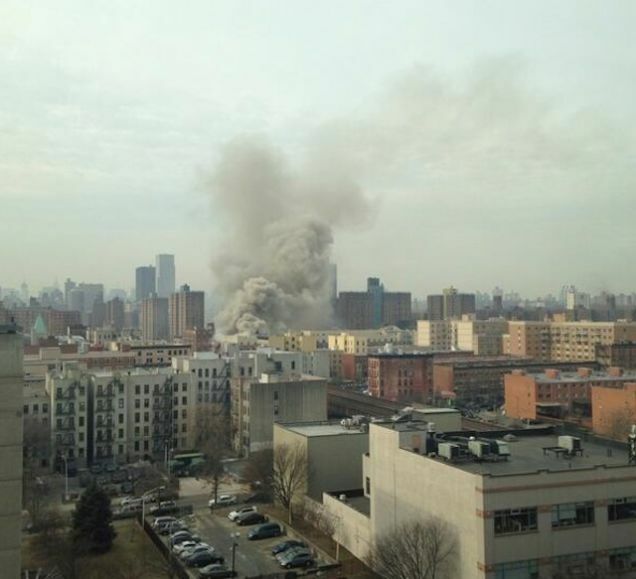 UPDATE 10:53 am: CNN is reporting that Con Edison was called to the building to investigate a possible gas leak just before the explosion. At least 11 people were injured in the collapse and transported to local hospitals, according to the Daily Mail and CNN. UPDATE 10:33 am: The FDNY says 39 firetrucks and 168 firefighters have responded to the fire, which was just upgraded to a 5-alarm fire. 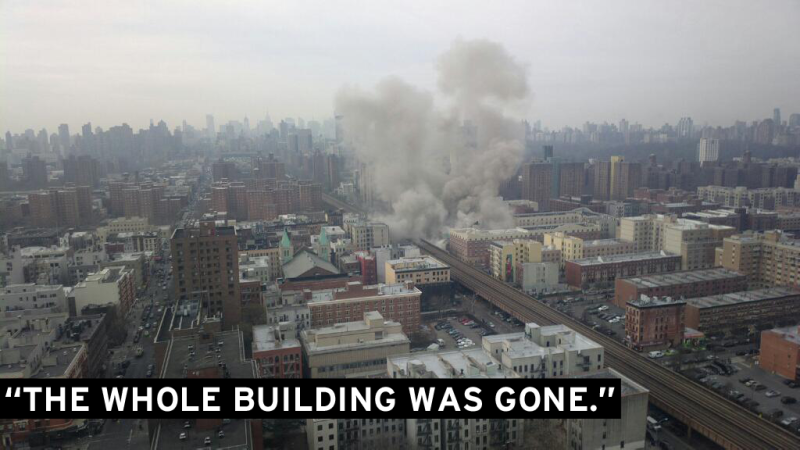 One of the two buildings is completely "gone" and the NYPD bomb squad is reportedly investigating. You can watch a live stream of the fire here. Here's a picture of the building before it exploded and collapsed.